A Marine Corps general is now leading the Department of Defense’s cyber offensive against ISIS. 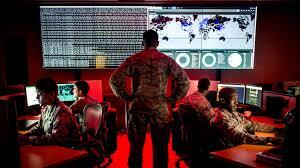 Since its creation in 2016, Joint Task Force-Ares has been led by the head of Army Cyber Command. But a U.S. Cyber Command spokesman confirmed to Fifth Domain Nov. 30 that the leader of Marine Corps Forces Cyberspace Command, Maj. Gen. Matthew Glavy, took charge of the task force Sept. 6. Joint Task Force-Ares is the cyber component supporting the joint and coalition efforts to degrade ISIS in Iraq and Syria and sought to deny ISIS’s use of cyberspace for spreading its message and coordinating operations. Under what is know as the Joint Force Headquarters-Cyber (JFHQ-C) construct – which provides planning, targeting, intelligence and cyber capabilities to assigned combatant commands – the head of Army Cyber Command supports Central Command, which has been home to ISIS’s primary region of influence in recent years. Under the same construct, the head of Marine Corps Forces Cyberspace Command leads Joint Force Headquarters-Cyber Marines, which supports Special Operations Command. “The transfer of Command to the Marines was a natural progression as the Marines continue to be aligned with USSOCOM and its transregional mission to counter violent extremists,” Joseph Holstead, a Cyber Command spokesman, wrote in an email response to questions from Fifth Domain. Joint Task Force-Ares will continue to work with Army personnel to help counter-violent extremist organizations, Holstead said. He added that Army staff will also continue to support the regional counter-violent extremist organizations mission in Central Command and Africa Command. The Army’s cyber component supports Africa Command and Northern Command in addition to Central Command. Joint Task Force-Ares’ previous commander has said ISIS might try to “resurge” in the virtual space. “Although the physical caliphate significantly has been reduced, what we think that will cause them to do is increase that virtual caliphate,” Lt. Gen. Stephen Fogarty, commander of Army Cyber Command, told reporters during a media roundtable in August.